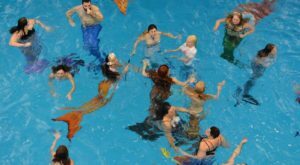 While many of the key Christmas events have already taken place, there’s still plenty of opportunity to get in the spirit of the season. 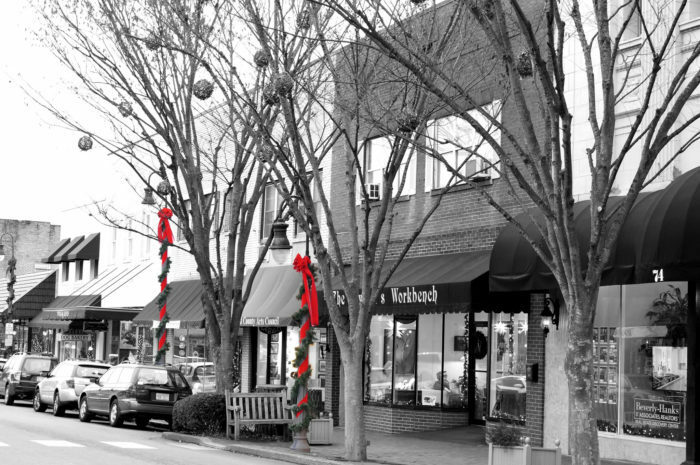 North Carolina has so many charming Main Streets that decorate to the nines for the Holidays. 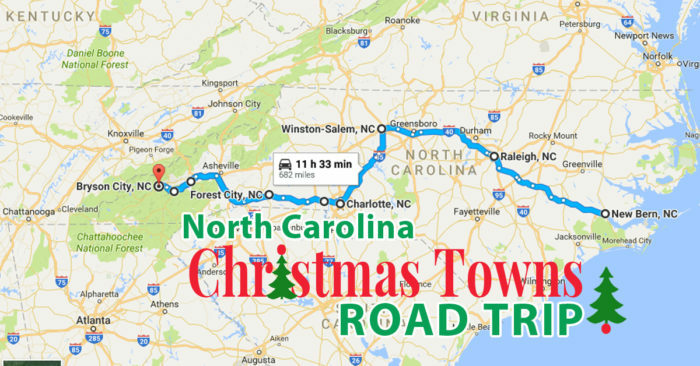 From small towns to big cities, this road trip will make your Christmas complete. The road trip starts you in one of North Carolina's most historic towns - New Bern. Next you'll travel to the Capitol City. 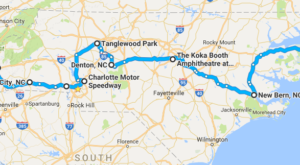 Following that make a short drive to Winston-Salem (and even consider a detour by Tanglewood Festival of Lights). 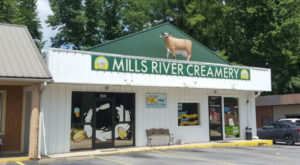 There will be plenty to do and see once you arrive in the Queen City, but make sure to save plenty of time for your next destination of McAdenville. Following Christmas Town U.S.A, make sure to grab a picture of the Sylva courthouse before heading to charming Forest City and Waynesville. Last but not least, the journey ends in the western region of the state, deep within the Smokies. 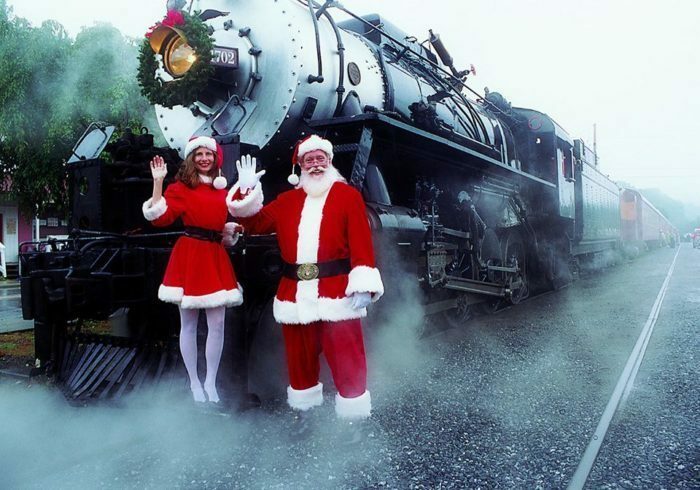 Spend some time in Bryson City and make sure to hop on board the Polar Express to go straight to the North Pole! New Bern certainly knows how to do Christmas. 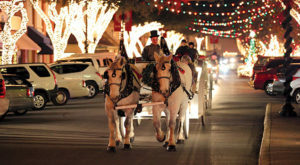 From Main Street looking charming as ever to Tryon Palace celebrating Christmas in 18th-century fashion. The history, beautiful architecture of New Bern, and riverside views make this a must-visit Christmas town. Photo courtesy of Zach Frailey - The Uprooted Photographer. The Capital City lights up come Christmas time. You can't beat the ornate decorations surrounding the state Capitol building nor in downtown. While in the area visit Durham to see the tobacco tower all aglow and also the Christmas Train in Denton. 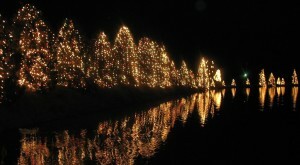 Come Christmas, Old Salem lights up in old fashion. Stroll the cobblestone, stop in and get some Moravian cookies maybe attend a love feast. 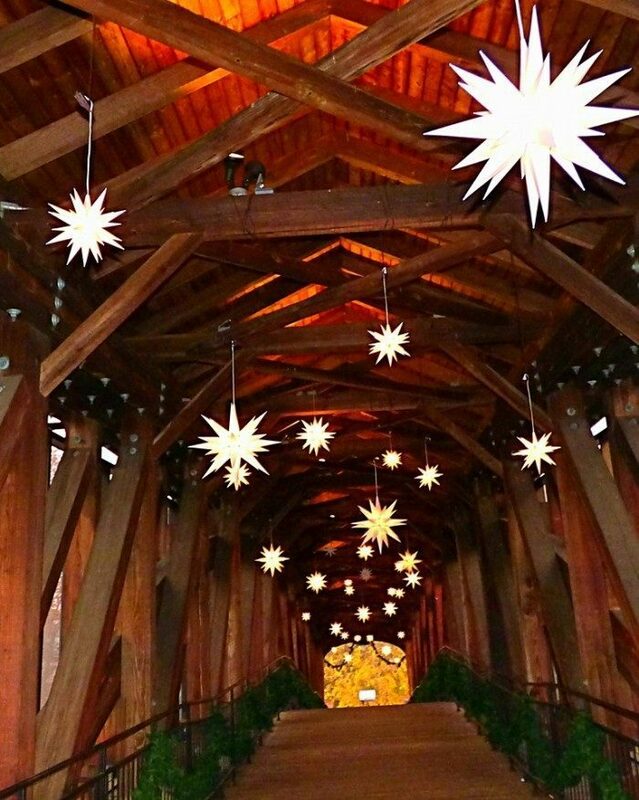 The bridge is always a huge draw this time of year with Moravian Stars draped over. 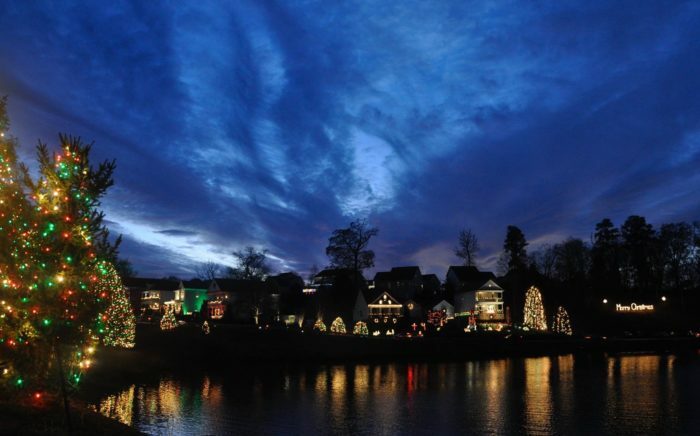 Not far away in Clemmons you'll find one of the best light shows in North Carolina - Tanglewood Festival of Lights. 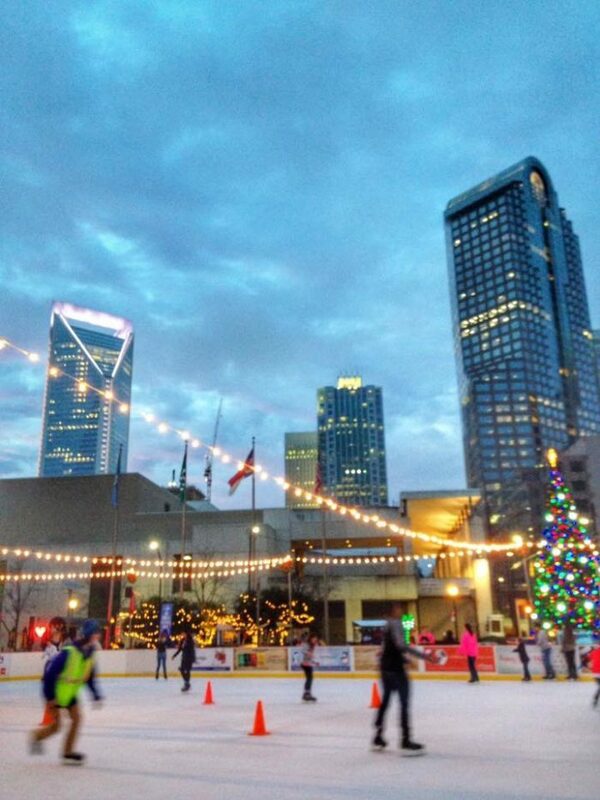 Ice skate amidst skyscrapers, get in plenty of shopping, catch a performance of Charlotte Ballet's Nutcracker or simply stroll through Uptown. One great place is the fourth ward neighborhood, with historic houses decorated to the nines in Christmas lights. 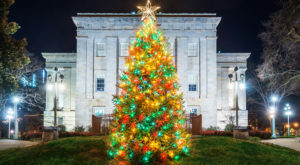 Nearby there's the quaint town of Belmont where you can visit Daniel Stowe Botanical Gardens to see amazing Christmas lights adorning each area of the gardens. It's pure magic. Not even 20 minutes away you'll find McAdenville - better known as Christmas Town U.S.A. Each house is uniquely decorated; no tree or building is left unadorned. There are decorations everywhere and a lovely pond to take it all in. Many walk or drive the 1.3 mile stretch. 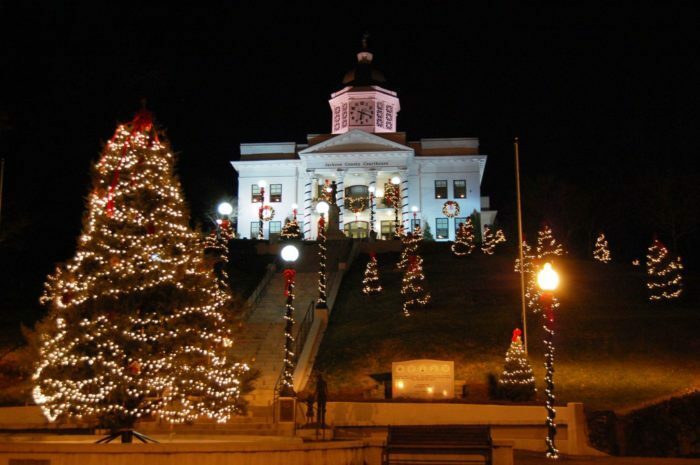 The courthouse in Sylva is one of the most photographed in the state, and especially at Christmastime. 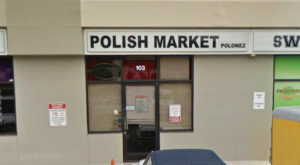 It's easy to see why. The small town also radiates plenty of charm. 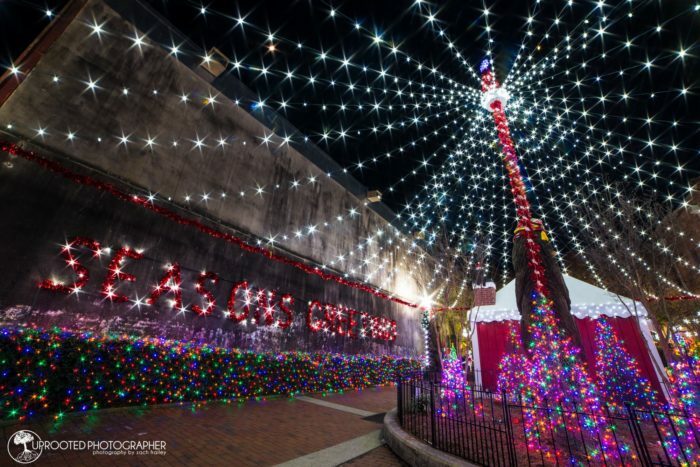 Around one million Christmas lights turn this small town into something from a Christmas card. All the lights are centered around the gorgeous town fountain. Forest City is such a gem of a town to explore as well, make the most of it and make sure to stop by Forest Drugs for a good old-fashioned meal. 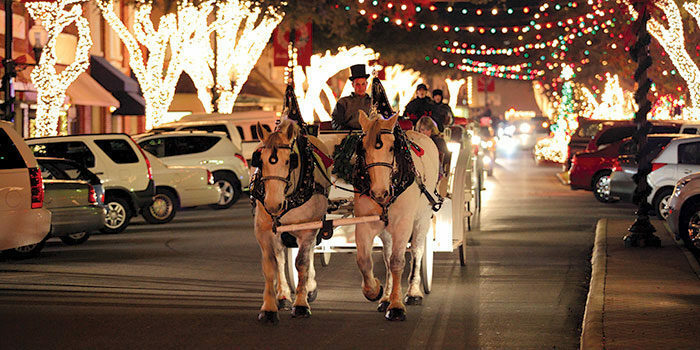 If you find yourself there at nighttime take a horse and carriage ride to make the most of it. Tucked away in the Smokies, Waynesville has a true 'small town' feel. If you're looking for that homey feel to ring in Christmas, this is the place. Where else would your Christmas journey take you than the North Pole? Well, the North Pole that can be reached from the Great Smoky Mountains Railroad, anyway. 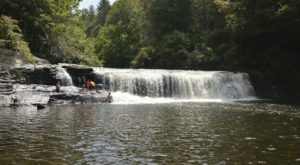 The train departs from Bryson City, but even if you skip the train there are plenty of things to do. The town has amazing restaurants, riverside breweries, and great views. The downtown area is also adorned with festive decorations. While many of the key Christmas events have already taken place, there’s still plenty of opportunity to get in the spirit of the season. 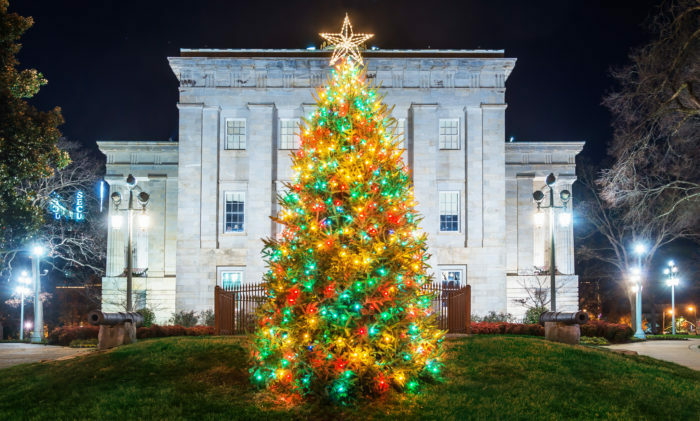 North Carolina has so many charming Main Streets that decorate to the nines for the Holidays. From small towns to big cities – this road trip will make your Christmas complete. We’re officially SO close to Christmas so make the most of it while you still can! One great way to visit these amazing light displays, and also eight more if you’re feeling adventurous. Happy Holidays!